In an effort to mitigate potential risks associated with the introduction of adventitious agents from animal-derived media components, the biopharmaceutical industry has largely shifted to serum-free and/or chemically defined media in cell culture production systems. Successful serum-free media formulations have been developed using plant-derived protein hydrolysates in combination with recombinant supplements such as insulin, transferrin, and human serum albumin, produced in nonanimal systems. The performance benefit provided by any medium supplement is subject to its interaction with other medium components present in the basal formulation, as well as any additional supplements being employed. In some instances, a combination of supplements may provide better performance than is seen when supplementing with the individual entities. Here we demonstrate such a synergistic reaction between a wheat hydrolysate and recombinant human serum albumin used to supplement a chemically defined growth medium for SP2/0 hybridoma cells. Subject to the supplementation scheme, the growth curves for each of the treatments were shifted as compared with the medium control. 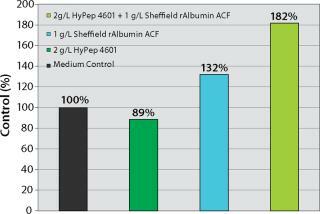 In cultures supplemented with recombinant human albumin alone, the growth curve peaks earlier and at a higher cell density than the medium control. Growth for the wheat hydrolysate supplemented cultures was more protracted, and the maximum cell density fell short of the medium control; however, growth declined at a slower rate after the peak cell density was reached. 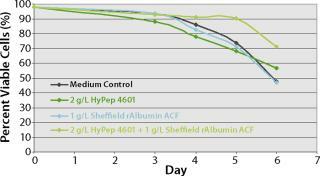 The growth curve for the cultures supplemented with both wheat hydrolysate and recombinant human albumin peaked two days later and at a significantly higher cell density than the medium control. Neither the wheat hydrolysate nor the recombinant human serum albumin improved cell viability individually; however, in combination, culture life was significantly extended over that of the medium control. 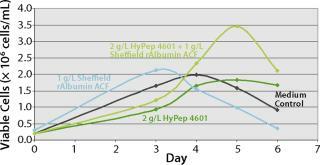 Supplementation with a combination of wheat hydrolysate and recombinant human serum albumin yielded a significantly higher IgG titer than the other treatments. Although there was a more than 30% increase in IgG titer in the cultures supplemented with recombinant human albumin alone, the IgG titer in the wheat hydrolysate supplemented cultures fell short of that for the medium control. This lower titer for the wheat hydrolysate supplemented culture was likely due to the low cell densities seen during the course of the experiment. James F. Babcock is a global cell culture applications manager and Amy Antosh is a senior applications technologist at Sheffield Center for Cell Culture Technology, 283 Langmuir Lab 95 Brown Road, Ithaca, NY 14850; 607-257-7720; James.babcock@kerry.com; Amy.antosh@kerry.com; www.SheffieldBioScience.com.